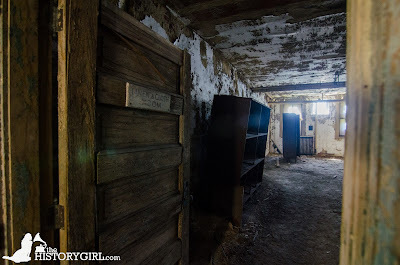 Exploring Ellis Island's Unrestored Hospital Complex ~ The History Girl! Ellis Island in New York and New Jersey was in operation from 1892 until 1954. In those sixty-two years, over 12 million immigrants were processed and entered the United State of America through its doors. Today, Ellis Island has a land area of 27.5 acres, but originally the island was a mere 2.74 acres. Over time, through landfill, the island expanded as its needs grew. 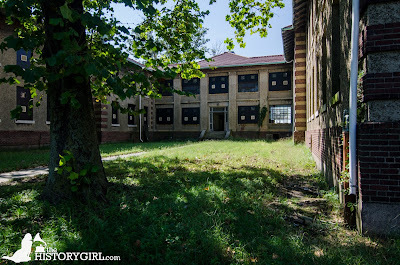 The south side of the island, the hospital complex, has been abandoned since 1954. 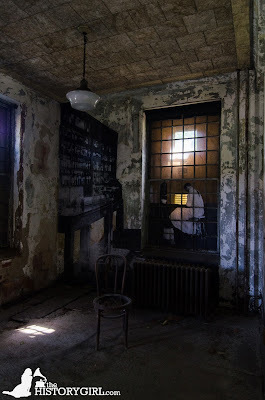 Through the efforts of Save Ellis Island, the non-profit partner of the National Park Service, hard hat tours of these severely deteriorated hospital wings are available and stabilization of these buildings have been underway for a number of years as funding permits. U.S. Marine Hospital Number 43, more commonly known as Ellis Island Immigrant Hospital, opened in 1902, in a building on the southern half of the island across from the main building. It was operated under the auspices of the United States Public Health Service. It was the nation's largest marine hospital. The doctors of the United States Public Health Service are best known for the role they played during the line inspection, which lasted approximately six seconds as immigrants climbed the stairs to the Great Hall. If immigrants didn't have any outward signs of a health issue, they proceeded unobstructed, medically. If their outward appearance exhibited symptoms of a disease or they had trouble walking, a code was drawn in chalk on the clothing of potentially sick immigrants. This mark meant you would most likely end up in the hospital. Inside the laundry building. 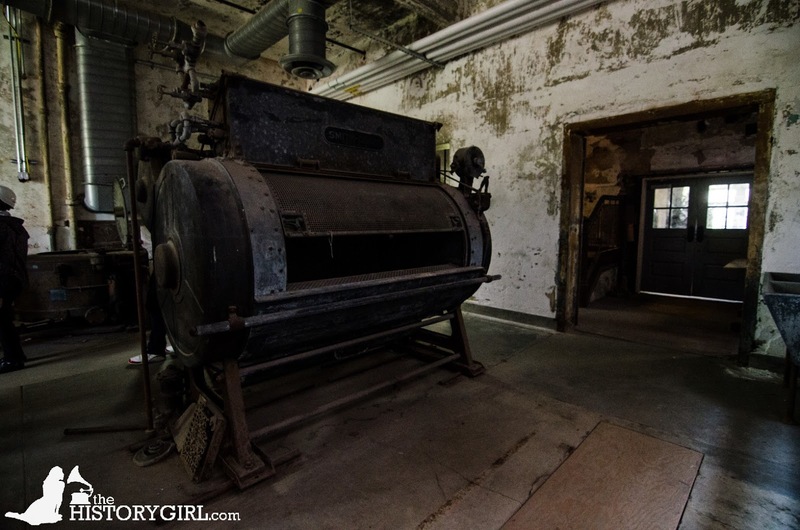 The laundry room cleaned 3,000 pieces of hospital linens a day. The hospital continued to expand as immigration increased and public health's importance grew. The hospital eventually had 750 beds across several buildings and was considered a paragon of public health management. Its planners incorporated the pavilion style hospital, which kept patients with the same diseases together. It also had a contagious disease wing and isolation rooms, a “psychopathic” ward, a laboratory, and a morgue. In the contagious disease wards, patients were organized by disease, including measles, scarlet fever, tuberculosis, mumps, and whooping cough. One of the design principles, touted by Florence Nightingale, was allowing in plenty of light and air (all year round). 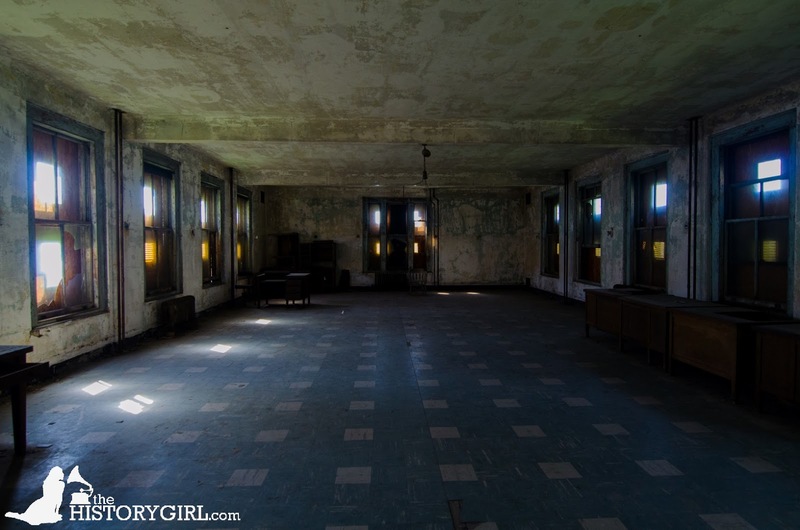 Ellis Island's hospital complex was one of the last pavilion-style hospitals built in the United States. 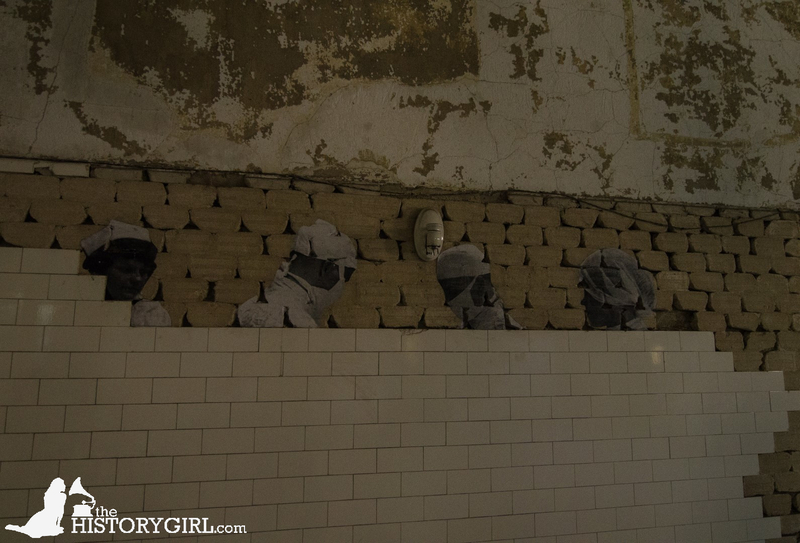 About 1.2 million people, roughly 10 percent of Ellis Island arrivals, stayed at the hospital. Over 350 babies were born at Ellis Island. Many of the babies were named after doctors and nurses, a testament to the treatment and respect that immigrants had for them. Unfortunately 3,500 people died while at the hospital and were buried in a potter's field in New York City. Due to safety procedures, no nurses or doctors contracted diseases from patients. Throughout the buildings on the south side of Ellis Island, you will see historic black and white images on the windows and walls. 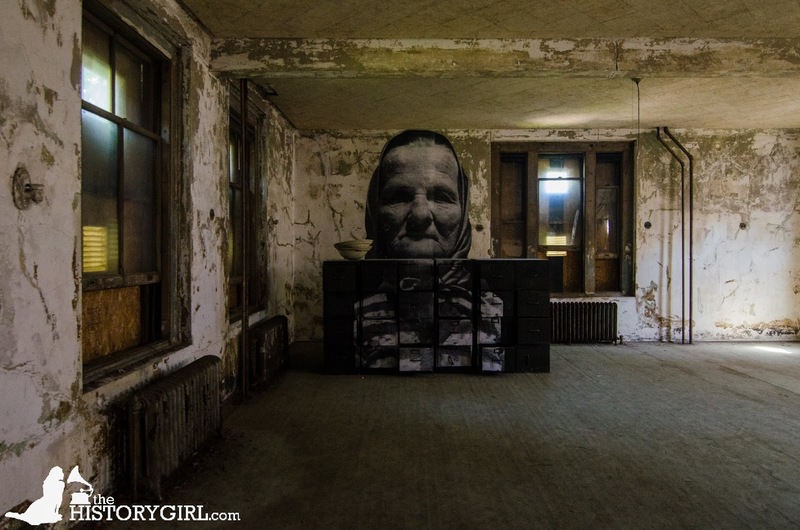 Twenty-six of these historic larger than life photographs were taken at Ellis Island in the early twentieth century and installed in 2014 as part of an exhibit titled, "Unframed - Ellis Island" by French street artist JR. By using these images, it evokes the range of emotions of coming to America and being at Ellis Island - hope, fear, excitement, and isolation. There are images of families looking out at the Statue of Liberty, while others are laid out on beds in the hospital, while yet others sit waiting for their chance at a new life in America once they have been approved for admittance. 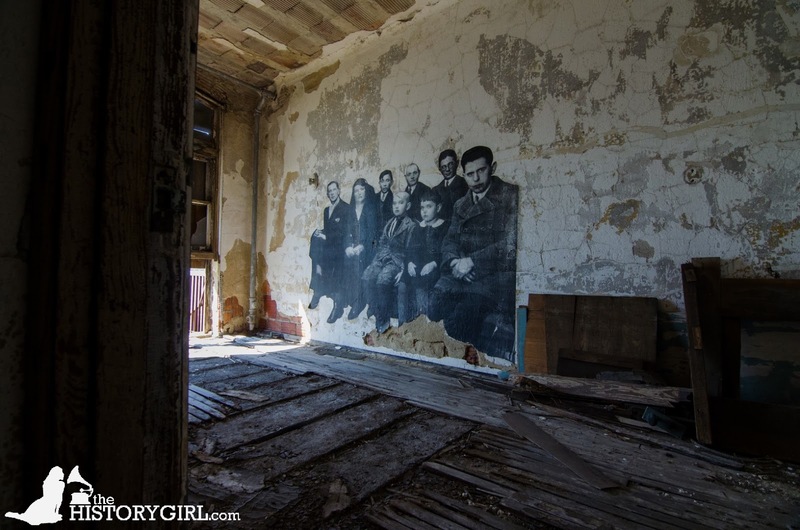 Most doctors and nurses who worked in the hospital at Ellis Island lived there as well. 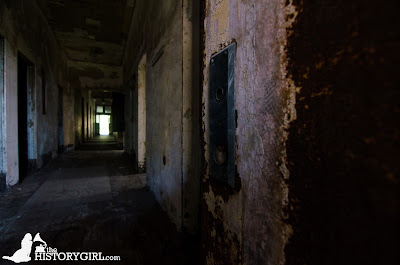 Nurses lived in dormitories above the rooms where patients were treated; the pharmacist mixed and dispensed medications from his house. The top two medical officers on the island, the chief of surgery and the chief of psychiatric, lived with their families in apartments connected to the end of the hospital complex. 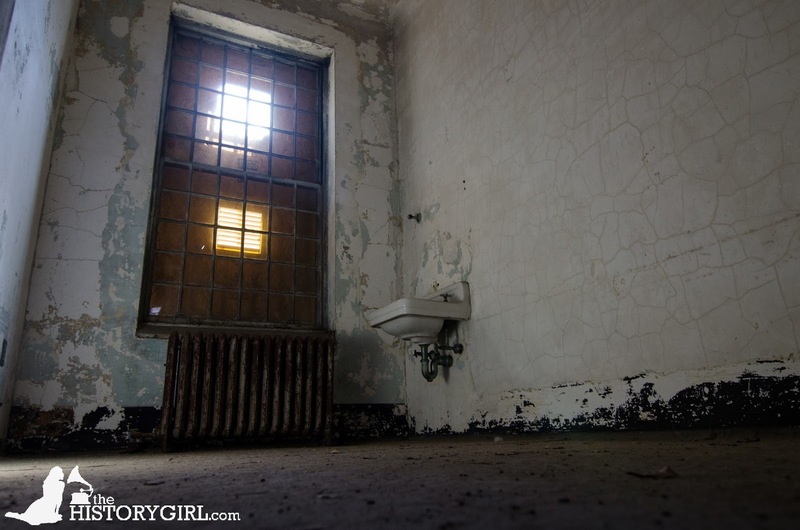 Inside a psychiatric patient's room. A hallway in the psychiatric ward. Linen and cloth storage room. 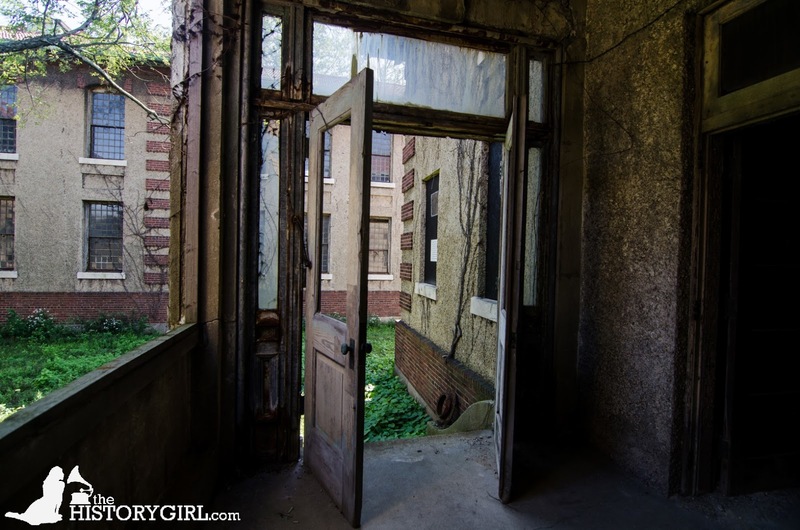 A former contagious disease ward. 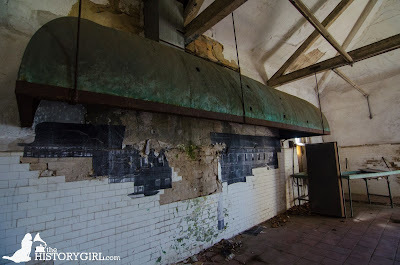 The hospital kitchen, which cooked 1,500 meals per day. A 47 year old Czech grandmother who suffered from measles. It is unknown what became of her. Ellis Island was added to the Statue of Liberty National Monument on October 15, 1965. The island had been abandoned and vandalized since it closed in 1954. 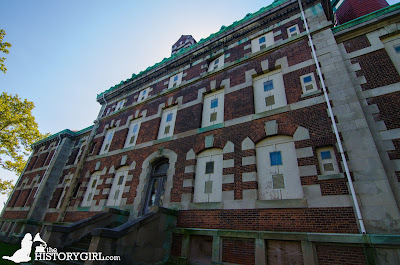 A construction budget of approximately $150 million for the restoration and rehabilitation of the main building and grounds at Ellis Island was raised by a campaign organized by the political fundraiser Wyatt A. Stewart and began in 1986. The main building reopened to the public as an immigration museum on September 10, 1990. 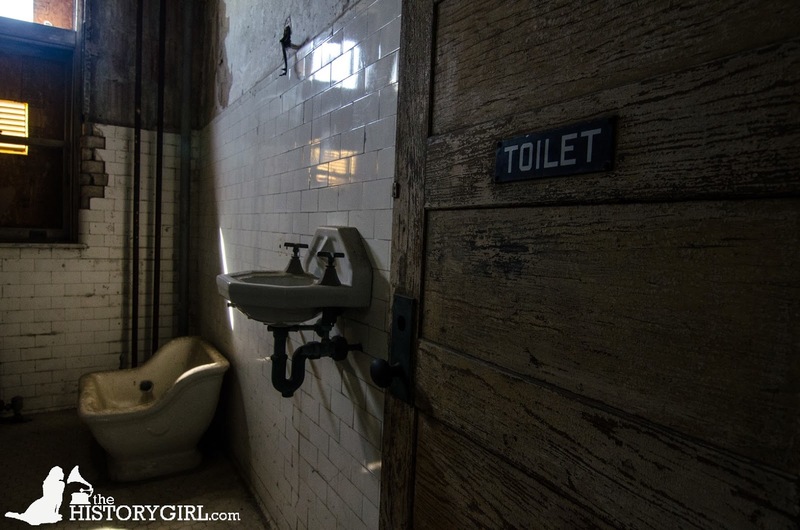 A tuberculosis sink in a restroom, designed just for spitting. 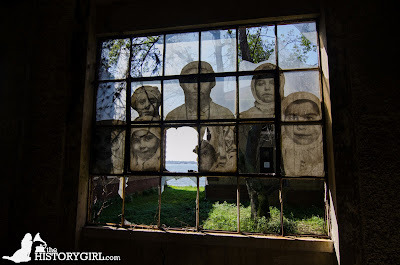 After New Jersey and New York's border dispute regarding Ellis Island was resolved in 1998 by the United States Supreme Court, a new non-profit was formed in New Jersey to raise awareness and funding for the restoration of the remaining buildings at Ellis Island. Since then, thanks to the efforts of Save Ellis Island, they have restored the marine corridors connecting the north side of the island to the south side, the Ferry Building and the Hospital Laundry Building, and continue to work towards the goal of preserving all of the abandoned and unrestored historic Ellis Island buildings. Their next restoration project is the 1937 outdoor recreation pavilion. The shelter was a gathering place for patients to enjoy social activities and fresh air during their stay in the hospital. Despite the work done already, there is much more to do. 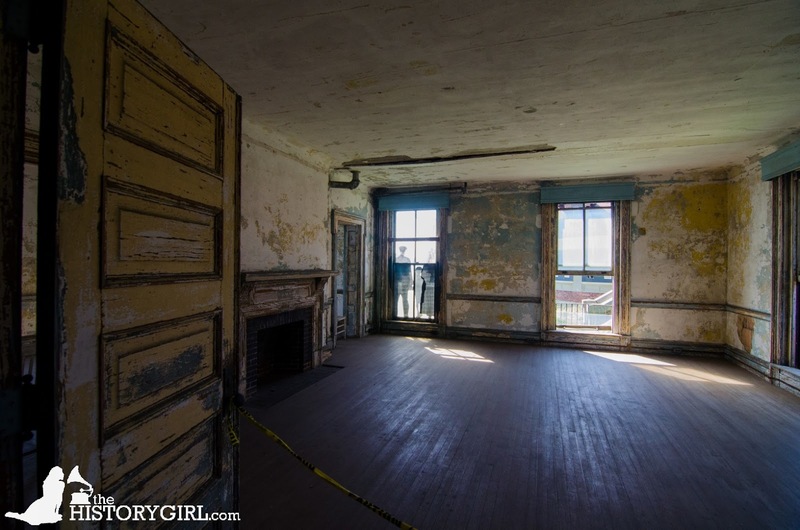 Due to damage from Hurricane Sandy in 2012, the first floor of the buildings were inundated with water. 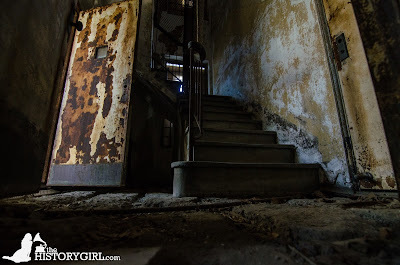 The damage was so severe in the original sections of the hospital that tours are not allowed in these structures. 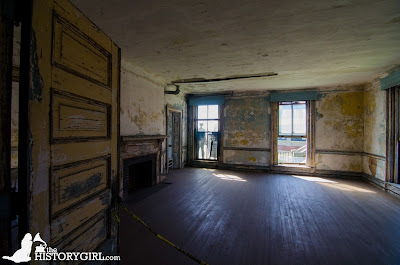 The second and thirds floor of all the buildings are also off-limits to tours due to stabilization that has yet to occur. Windows, window panes, and doors throughout the complex are missing or broken, allowing the elements to enter unobstructed. Save Ellis Island operates hard hat tours so that visitors may have the opportunity to see the other side of Ellis Island, one that is often overlooked. One of the goals of Save Ellis Island is to tell a more complete story of the island and the immigration process by preserving the remaining hospital buildings in a state of "arrested decay." For the thousands of immigrants that passed through the Ellis Island Hospital and successfully recovered, it was their first experience in an American hospital and hopefully one that treated them well. 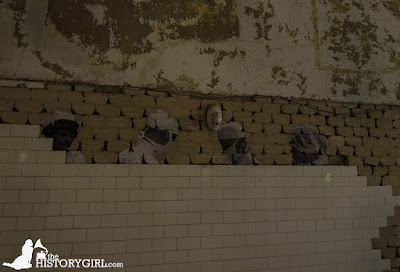 To take a hard hat tour of the Ellis Island Hospital Complex, purchase your tickets through www.statuecruises.com. The ferry ride to Ellis Island is included in the ticket price when departing from Liberty State Park in New Jersey or Battery Park in New York.